Do not let go of those legs! Since that first time I was given the opportunity to assist the rehabber, I have held a number of hawks on the examining table. This is a story of one of those times and illustrates how teaching and learning takes place in serendipitous places. 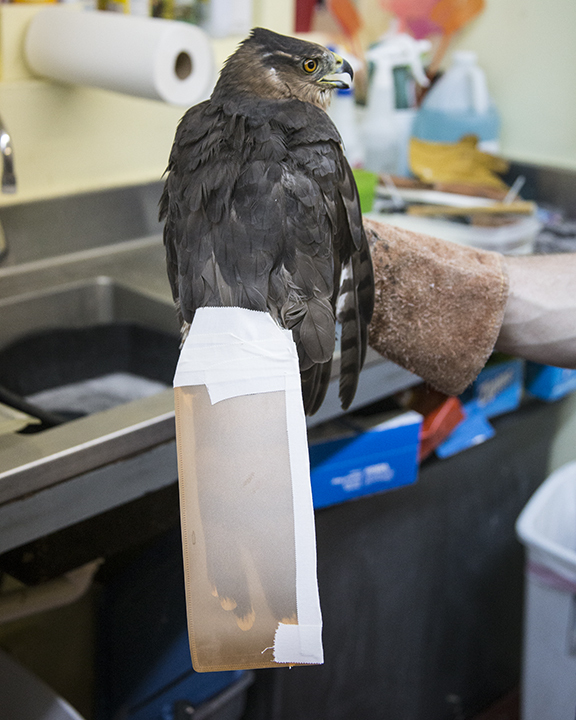 An immature red tail hawk (pictured) had been brought in to the clinic and the rehabber had placed a hood on the hawk’s head. The hood, by limiting the hawk’s sight, helps to calm the bird during the examination. The hawk is placed on his back and then it is time for my role in this process – while wearing very thick gloves, I am gripping the hawk’s legs, one in each hand and holding him firmly on the table. The rehabber then manipulates the wings to check for broken bones and completes an initial exam looking for other possible injuries. Often hawks are brought to the clinic because they have been hit by a car or flown into window glass and are a bit woozy. After the exam the hawk will be kept in a large indoor cage so he can be closely watched. Hawks are not kept indoors for long periods of time and we have large outdoor cages, up to fifty feet in length, for them to rehab in until they can be released. While they are indoors their tails have to be wrapped for safety (pictured) – a hawk does not particularly like small enclosed spaces and the tail is wrapped to prevent injury to any of the tail feathers. 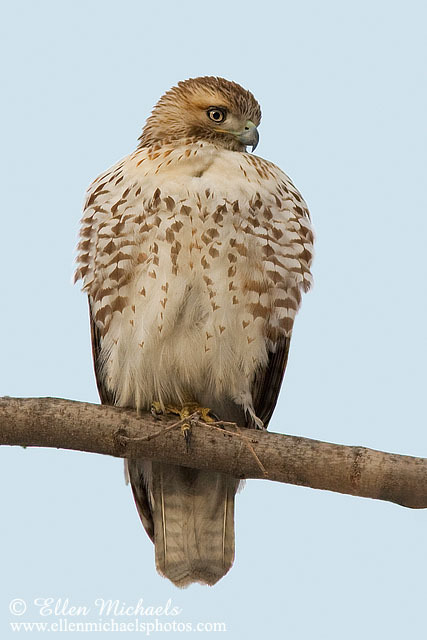 Any damage to the tail feathers can impact the hawk’s ability to fly so this is an important precaution. I was entrusted to wrap this hawk’s tail and had previously been given detailed instructions and practice. We use tape similar to a packing tape that has glue on one side. After taping this hawk’s tail and receiving the rehabber’s approval, the hawk is moved to an indoor cage. My wrapping job did not look as good as the one pictured, but it was sufficient to offer protection for the hawk’s tail feathers. I have had the amazing opportunity to assist the rehabber in this process a few times by now. The experiences have heightened my knowledge and appreciation for the strength and sheer beauty of hawks. They have taught me a reverence for the natural world, and deepened the awe I feel every time I see a raptor in the wild soaring in the wind or roosting in a tree as it searches for prey. Learning to give of myself to assist animals in need has been and continues to be a very valuable lesson that informs my awareness of my place in the web of all living beings. 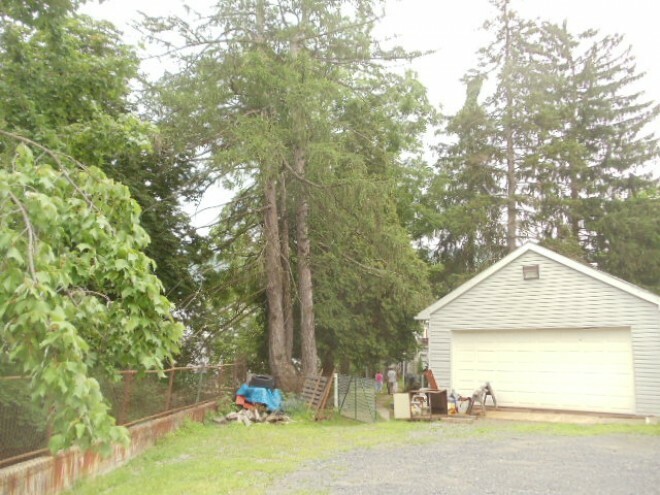 This entry was posted in animal rescue, Wildlife clinic and tagged animal rescue, memoir, red tail hawks. Bookmark the permalink.